We are very proud of our staff of highly-qualified singing instructors, who are available to teach in your home. Mr. Laws, an accomplished tenor who has years of performance and teaching experience, teaches voice students of all ages and styles, including the seasoned professional singer. Read more about one of our instructors below, or give our office a call at (516) 433-1822 for more information. J.C. Laws is an accomplished Operatic Tenor, Choral Director, and Conductor. 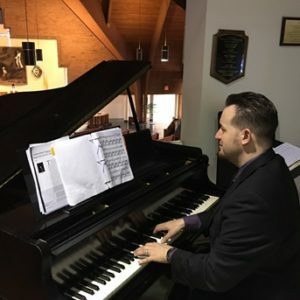 He is also a highly skilled Rehearsal Pianist, Lyricist, Composer, and Arranger who offers master classes, voice training and coaching, audition/adjudication preparation, and workshops on singing technique and acting. In addition, Mr. Laws has served as a judge for a diverse array of musical and theatrical competitions. Mr. Laws teaches using the bel canto technique, combined with modern scientific study of the anatomy of the voice, larynx, and mouth as well as positioning of the body to achieve the healthiest resonance in any style or genre of music. For more than 15 years, Mr. Laws has taught people of all ages and skill levels including professional singers, recording artists, college and university students majoring in music, high school pupils auditioning for New York State School Music Association (NYSSMA) recognition and awards, and students auditioning for various musical activities. Mr. Laws’ students have had great success in earning high scores on NYSSMA adjudications, auditioning for and earning lead roles in musicals and operas, winning solos for choirs, and gaining entry into top university music schools. In addition, Mr. Laws’ Contemporary Commercial Music (CCM) students have gone on to strengthen their voices and better prepare themselves for recording and touring. Over the course of his extensive career, Mr. Laws has performed in many Operas and Musicals at prestigious venues such as Carnegie Hall (New York, NY), Avery Fischer Hall (New York, NY), The Beacon Theatre (New York, NY), The Howard Gilman Opera House (The Brooklyn Academy of Music, NY), The New Jersey Performing Arts Center (Newark, NJ), The NYCB Theatre at Westbury (Westbury, NY), The Wellmont Theatre (Montclair NJ), The Waterville Opera House (Waterville, ME), Symphony Hall (Boston, MA), Atlas Performing Arts Center (Washington, D.C.), Koger Center for the Arts (Columbia, SC), The Adrienne Arsht Center for the Performing Arts/Ziff Ballet Opera House (Miami, FL), and many more. He has studied and performed with some of the most renowned voice teachers and coaches in the opera and musical theatre worlds including Lucine Amara, Marni Nixon, Nico Castel, Licia Albanese, and Cornelius Reid. He has sung and has an expertise in teaching the finesse of singing in such diverse languages as Italian, French, German, Spanish, Latin, and, of course, English. Besides offering private lessons and workshops, he has been the Music Director for various Churches and sings for the Televised Mass on the Telecare Network. Mr. Laws has also studied conducting under great conductors such as Vincent LaSelva, Tony Amato, Robert Shaw, and John Rutter. Mr. Laws is a member of The National Association of Teachers of Singing (NATS), The New York Singing Teachers Association (NYSTA), The Music Teachers National Association (MTNA), The National Association of Pastoral Musicians on both the national level as well as the local Rockville Centre Chapter (NPM), Opera America, and the Metropolitan Opera Guild. Cosmo Mallardi, vocalist, voice and instrumental instructor, composer, pianist, and bassist, won an Emmy Award for his work on the soundtrack for the documentary film Farmboy. In addition to composing and arranging Farmboy, he plays piano, acoustic bass and performs the vocals on the title song “The Dream”. He has worked on Broadway as a bassist and conductor, and served as music director/conductor for the national tours of Les Misérables, Jekyll and Hyde, and Disney’s Aida. Mr. Mallardi worked as Music Supervisor for Disney on the Korean and Japanese productions of Elton John and Tim Rice’s Aida, and was honored to conduct and produce the Japanese cast album. Currently, Mr. Mallardi is an adjunct professor of Theatre Voice at Long Island University. He trains vocalists in all genres in his studio, and also teaches piano. Several of his voice students have appeared in such Broadway shows as Mary Poppins, The Color Purple, Sweet Charity, and the Spring 2019 debut of Be More Chill. Mr. Mallardi’s voice teaching philosophy is to train singers to develop a healthy technique, to understand how to connect to their instrument, to connect their speaking voice to the singing voice, and to “sound like themselves” with their own unique sound. He has a B.M. from Mannes College of Music and a M.M. from Yale College of Music, as well as a diploma from Juilliard Pre-College. He has studied with Brett Manning, Neil Semer, and Mary Setrakian, and has also trained in Alexander Technique and Seth Riggs Speech Level Singing.